Russia’s central bank raised rates 25bps to 7.75% surprising the market, reflecting the need to contain RUB weakness. Not all news is negative – Japan Tankan was better than feared, but outlooks are worse. The Japan flash PMI was better as well. WPI fell in India and leaves some hope that RBI is on the right path regardless of Modi pressures. The net result is that we are going back to a US growth divergence world – unless the retail sales today disprove some of that – the US rate moves and oil drops have left room for FOMC pausing and ongoing 2019 growth above potential. The USD is king still – while the EUR suffers. If you want to trade global risk just focus there. 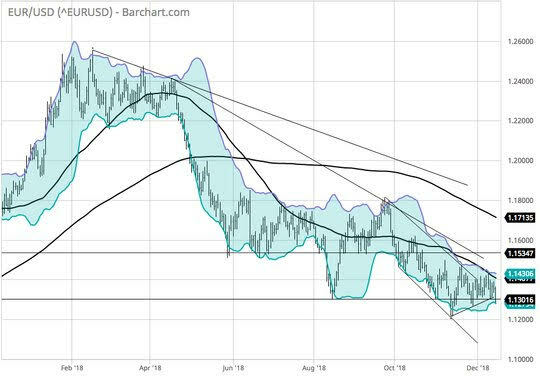 EUR 1.1180 is the next target. Question for the Day: Is the ECB and others wrong about the soft-patch? Markets are going to focus on growth outlooks for 2019 and the risk of a recession globally as trade fears and political messes drive down confidence everywhere. 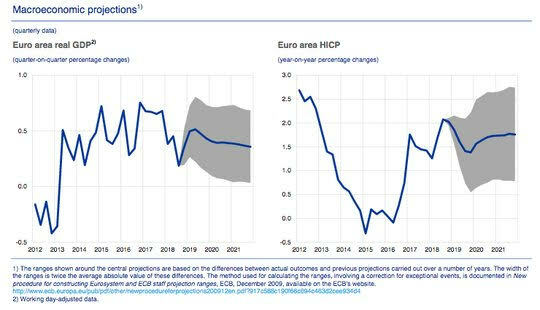 Yesterday brought the ECB and the Draghi news conference where the central bank set forth the expected end of QE and lowered its growth and inflation forecasts. Draghi argued that the slowing growth was normal after a year of over-potential gains. Today the German Bundesbank released their own forecasts and this is how they put it: “Germany's economy looks set to continue booming for the time being, and it will ride out the recent setback in the third quarter of 2018, which was largely down to temporary supply-side difficulties in the automotive sector. In their latest projection, the Bundesbank’s economists expect the economy to quickly overcome the dip in growth these problems caused.” The problem for markets is that the forward-looking data from the flash PMI reports today and other indicators of late all suggest that 4Q growth in Germany and in Europe as a whole is weaker than expected and 1Q is setting up for further trouble. The soft-patch risks turning into quick-sand should there be other shocks to the economy. View TrackResearch.com, the global marketplace for stock, commodity and macro ideas here. Mr. Robert Savage is the Chief Executive Officer of CCTrack Solutions. He is also the Chief Executive Officer, Editor-in-Chief and Head of Research of Track.com, an online platform for investment research and market ideas. He joined FX Concepts as COO and Chief Strategist when Track.com was acquired by FX Concepts in 2012. Before founding Track.com, Mr. Savage was the Managing Director of FX Macro Sales at Goldman Sachs, where he published widely-read and insightful research focusing on the FX markets and the macroeconomic environment. Prior to his 23 years of experience with Goldman Sachs, Mr. Savage was the Head of New York Foreign Exchange Trading for Lehman Brothers and a Director of Proprietary Trading at Bank of America Securities. Mr. Savage received a B.A. in Political Philosophy from Yale University.